When your kids get a raging case of cabin fever one of the best solutions is to get outdoors and revel in winter weather. Snowshoeing is one option – it’s as old as the Native American hunters and trappers and as current as activities in and around Genesee County. 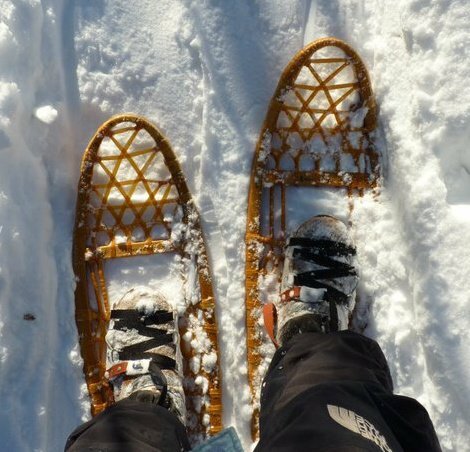 Snowshoeing is as easy as it is enjoyable and doesn’t take as much practice and skill as cross-country skiing, says Genesee County Parks & Recreation’s marketing assistant Hollie Marlett. Rentals are available on a first-come, first-served basis on any days when there are, at least, three inches of snow on frozen ground. 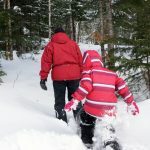 There’s always a snowshoeing or a skiing trail, she adds, noting that the parks ungroomed routes offer an opportunity to experience nature at its best. You could also clomp through Kearsley Park downtown or even along your backyard or neighborhood sidewalks after a fresh snowfall. 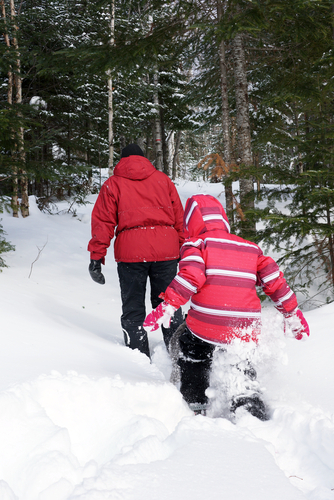 If your family is new to the sport remind everyone to lift their feet higher than when walking and to keep their feet a shoulder’s width apart, so the snowshoes don’t catch on each other. 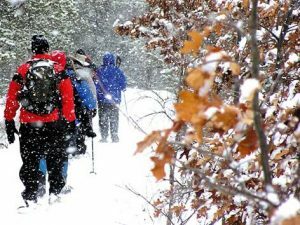 Experts at the Appalachian Mountain Club recommend that newcomers start on packed snow, which is easier to navigate than deep snow. “Once the kids are confident, try the fluffier stuff,” they recommend. You can also rent or purchase snow shoes at Shoemakers Ski Shop or Play it Again Sports in Flint, along with ski poles to help keep you upright. The “Play” store has cross country/snow shoe poles for $10 used. You can check Amazon.com for cute, kid styles or serious exercise snow shoes and poles for as little as $21. Just avoid “Big-Footing” on top of the cross-country ski trails that require smooth tracks. Don’t forget Midland’s Chippewa Nature Center, which loans snowshoes on a first come, first served basis. Call 989.631.0830 to reserve a pair. 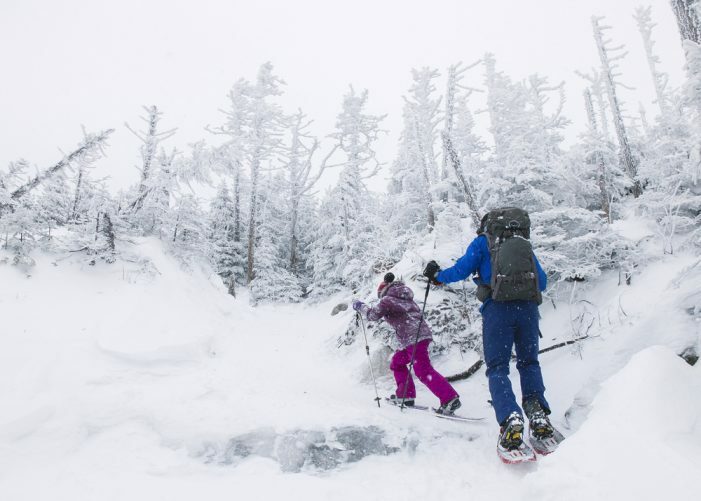 The Center may add guided snowshoe hikes this season since a number of scheduled events were cancelled due to dangerous arctic temperatures. Check their website for details. Many of Michigan’s state parks also offer both lessons and snowshoe rental. Sometimes you might even find veteran hikers glad to lend assistance on a sunny, snow day. Just remember to keep your feet warm by wearing boots – not tennis shoes, which absorb moisture. You’ll be surprised by all the fun you can have outdoors.